Develop Great Percussive Guitar Playing Technique Now And Get Ready To Amaze Everybody Who Hears You Play! One of the great hidden secrets of an acoustic guitar is that it is also a percussive instrument. 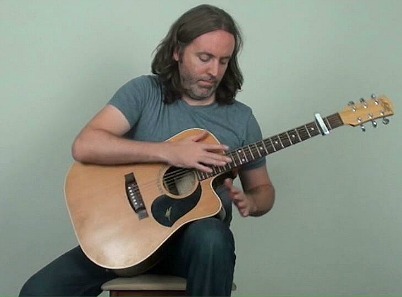 Through developing what is known as percussive guitar technique, you can essentially turn your acoustic guitar into a drum. Imagine that, having the ability to not only play chords and the like on your guitar, but to also provide a beat/groove to play these things along with. And this all comes from you, no one else is playing along. Warning: This is not one of those online resources or youtube tutorials that try’s to teach you something that is way beyond your ability. This is very possible for anyone including YOU to do. Percussive guitar playing is not something that requires years of study before being able to play anything that sounds any good. Have the skills and know how to emulate a variety of percussive sounds on your acoustic guitar including body percussion and string slapping techniques. This is easier than you may think. Learn how to incorporate the beats and grooves of percussive guitar technique into the songs that you play on the acoustic guitar. It’s one thing to create the percussion, but you also want to be able to use it in your everyday playing. Have the ability to sound like a one man band without the need for cymbals strapped to your legs and a drum kit on your back. Looks so much cooler too when you can do all this with just the one acoustic guitar. Blow the minds of those that hear you play! They will be amazed at how you are able to play both the percussive and melodic parts of a song at the same time. Massively improve your rhythm and timing skills, so that everything you play on the guitar sounds better, while at the same time, developing one the most impressive, and fun techniques you can learn on an acoustic guitar. Get INSTANT FREE access to your Percussive Guitar Playing Video/PDF by typing your name and email address into the box below and clicking “Show Me The Video"